The murder of the senior journalist and social activist Gauri Lankesh is yet another proof of a culture of extreme intolerance being bred and promoted in India by the right-wing forces with the tacit support of the central government. 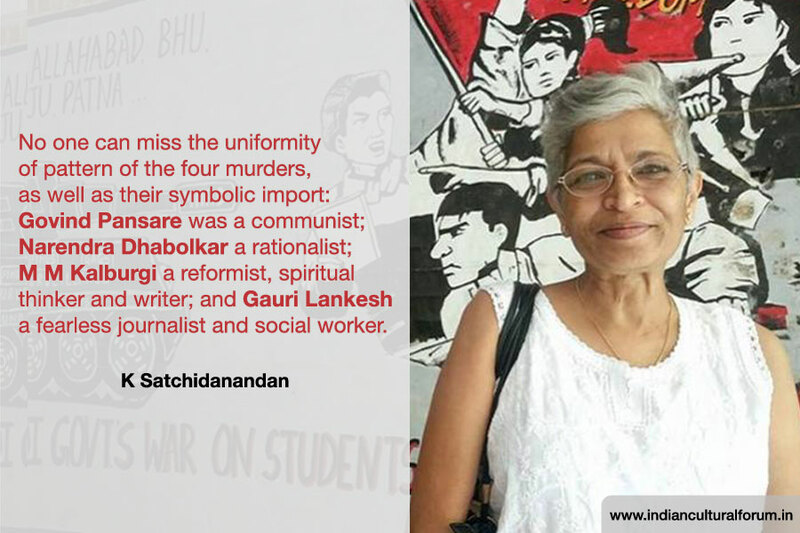 No one can miss the uniformity of pattern of the four murders, as well as their symbolic import: Govind Pansare was a communist; Narendra Dhabolkar a rationalist; M M Kalburgi a reformist, spiritual thinker and writer; and Gauri Lankesh a fearless journalist and social worker. This shows who are the real targets of communal fascism in India. But no threats or murders can stop the voices of sanity and change in India; every act of cowardice will only strengthen our resolve to fight the dark forces that try to throttle the secular , socialist values and fundamental rights enshrined in our constitution. Gauri Lankesh will live on within every Indian committed to the cause of democracy and freedom. In solidarity with all progressive forces.